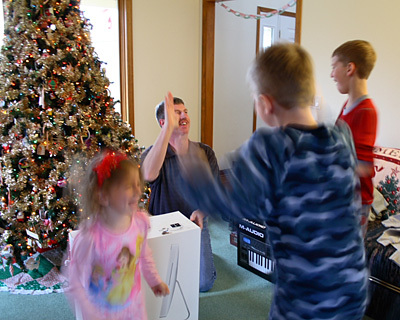 "Here is a shot that my wife captured of me and the kids celebrating after I opened the new 20” iMac," said Ernie Hagenow. "This was our family gift for Christmas. Our oldest son was so happy he had tears of joy." "The motion blur was recorded because this was the ninth shot in a row and the flash fell behind in recharging." "I look forward of going to the next level in my digital photography with the iMac and Aperture. My kids love Photo Booth, and as you see it in the background the M-Audio keyboard has been used a lot in GarageBand." This fun grab shot was captured with a Canon EOS 30D set to ISO 200, shutter speed was 1/13th and aperture at f-3.5, exposure compensation +1/3. And yes, the flash didn't fire. Nice shot and wonderful story. The 20" iMac is a wonderful family gift. Congratulations!